I really hope the “do do do do” will make some punks here upset. Real punks are so easily upset by great powerpop. I don’t know much about The Fans. This is their first 7inch out of two. They also appeared on a compilation LP released by Fried Egg. 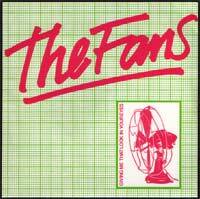 Japans 1977 Records have re-issued both their records and a compilation CD that I would love to hear: The Fans-You Don’t Live Here Anymore. Holy crap I found The Fans on Seeqpod when I put in a search for “Stay the Night”…It was so modern sounding…Holy crap…it’s the best band I’ve never heard of before…I have to tell someone…oh gosh…Stay the Night is the most awesome thing I’ve heard…Lemmie start a band now. Here’s an impossibly rare clip of them playing “Giving me that Look” I couldn’t believe that it existed. There are some other clips of them on the same channel. I haven’t heard this song in nearly 25 years (had it on a cassette tape I made of a Detroit radio show called “Dangerous Exposure” back around 1980). It’s one of those songs that deserved a far wider audience that what it got. Powerpop rules! This will be good for my collection of “eye” songs….thanks!! I absolutely love the “You Don’t Live Here Anymore” single — such a great powerpop tune with wonderful vocals. What are the odds? Exactly one year to the day I see your reply. Thanks, Peter. Keep up the good work, you crazy Swede.